Butler Hyundai's Blog | Home of the 20 year / 200,000 mile warranty. Home of the 20 year / 200,000 mile warranty. Win A Trip For 2 to Super Bowl 50 from Hyundai! We just knew something great was going to come of Hyundai’s partnership with the NFL. We were disappointed to hear that this year’s Super Bowl MVP wouldn’t be driving home in a Hyundai, but what better way to deal with that disappointment than watching the big game in person? Hyundai is sending 50 people to Super Bowl 50 in Santa Clara, California, and time is running out for your chance to win a trip for you and a guest to witness football history in person. There are three ways to enter the competition, allowing for up to 16 entries per person. 1 – Go for a test drive – This is the easiest way to enter Hyundai’s Road to the Super Bowl sweepstakes, and also by far the most fun. Simply go for a test drive at Butler Hyundai, and you can submit 10 entries for a chance to win tickets. 2 – Enter online – If you want to pad your odds, you can always enter online, although this method only allows to to submit 1 contest entry. 3 – Share and Get Friends to Enter – If you share Hyundai’s contest, you get to submit an additional entry for each friend who enters because of your referral for up to five additional entries. Sadly, we’re prohibited from entering this contest, but we would like little more than to see Butler Hyundai friends and customers in the stands come February! The contest ends on January 15th, 2016, so come in and test drive today! According to the National Highway Traffic Safety Administration (NHTSA,) rear-end collisions account for 23-30% of vehicle accidents every year. We know that airbags are an essential part of how car manufacturers keep drivers and their passenger’s safe, so, as a friend recently asked us: why don’t rear-end collisions set off a vehicle’s air bags? In short: because while airbags help to keep passengers safe in many situations, they also have the capacity to do a great deal of damage. In a head-on or side collisions, airbags inflate to dampen the impact for the vehicle’s occupants. Air bags are designed to deploy in such a way that passengers will make impact with them as the air bag begins to deflate, thus significantly decreasing the impact experienced. But in rear-end collisions, passengers are likely to lurch forward with impact, meaning that an air bag could potentially make contact with their head as it expands at 200 miles per hour. In an otherwise harmless rear-end collision, an airbag deploying could cause infinitely more damage than the actual accident. To ensure safety in the event that you are rear-ended, keep two things in mind. First, always be sure to wear and securely fasten your seatbelt while driving. A simple fender-bender can turn very serious without the use of a seatbelt. On a related note, always be sure to drive with the steering-wheel at least 10 inches from your body. This will not only allow the airbags to deploy as intended, but will also help ensure the seatbelt prevents you from making contact with the vehicle in case of a minor collision. Winter means bad weather and plenty of places to go, so please join us in making safe driving a priority this Holiday season. Despite being one the most respected and cited authorities on vehicle safety, the Insurance Institute for Highway Safety (IIHS) is widely misunderstood. Like the National Highway Traffic Safety Administration (NHTSA,) the IIHS painstakingly researches the effectiveness of vehicle safety features, but unlike the NHTSA, which is part of the department of transportation, the IIHS is an independent, nonprofit organization. For an independent research company, the IIHS has had a remarkable impact on carmakers. Innovations like rollover testing and the small overlap test have helped keep car companies prepare for real-world situations and save lives in the process. The IIHS has now turned its attention to a new frontier of safety innovation: headlights. Specifically, the IIHS has identified adaptive headlight technology, which Hyundai and Kia have recently introduced on select models, as a promising emerging innovation in accident prevention. As soon as 2017, carmakers that want to achieve IIHS’ coveted Top Safety Pick+ designation, which highlights vehicles that use technology to enhance their already industry-leading safety features. So what can adaptive headlights do to make driving safer? In short, by using cameras and wheel-direction to aim headlights in line with the vehicle’s trajectory, adaptive headlights make driving at night safer. The Highway Loss Data Institute, IIHS’ research division, found that vehicles with adaptive headlights are considerably less likely to be involved in property-damage liability claims than vehicles with traditional, fixed headlights. As a result of this research, the IIHS will make headlight technology a focus moving forward, and carmakers will almost certainly start adopting headlight tech they would have waited to implement as a result of new IIHS standards. By releasing vehicles with adaptive headlights before most of the world’s automakers, Hyundai and Kia have cemented themselves as frontrunners for future IIHS safety rankings. Gorgeous, safe, and fun to drive, things are looking good for Hyundai and Kia! The Hyundai Genesis has always been in a league of its own, and now Hyundai is giving it a brand of its own to match. What Lexus is to Toyota and Infiniti is to Nissan, Genesis will now be to Hyundai. 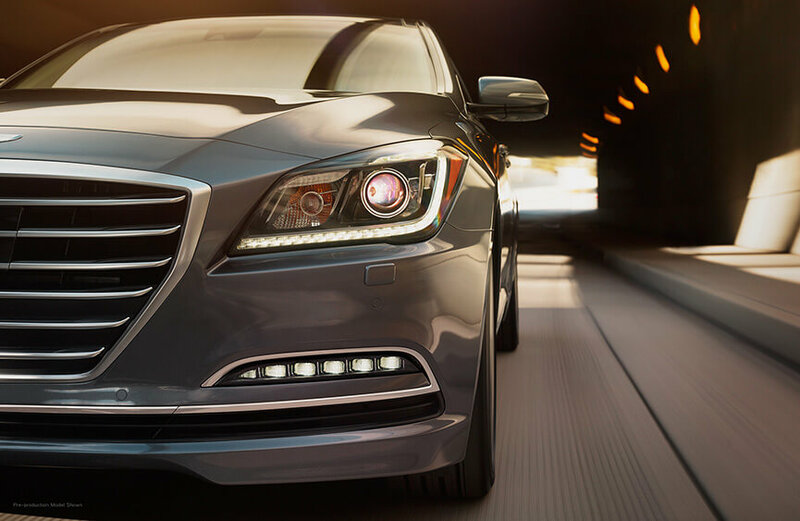 While we loved the fact that the Genesis was perhaps the only car of its caliber to share the same brand-name as entry-level vehicles, this change of strategy on Hyundai’s part spells exciting things for the future of the Genesis. Keen-eyed observers may have seen this move coming; the first Genesis to be released in the U.S. kept Hyundai’s trademark ‘H’ logo, but in 2014 the Genesis arrived with a distinctive winged badge, marking it as the lone luxury vehicle in the Korean automaker’s lineup. Hyundai is now banking on those wings – and the remarkable vehicles they adorn – to carry the company’s luxury aspirations to new heights. Genesis (we’re going to have to get used to saying that!) plans on releasing six new vehicles by 2020, including a sports coupe, a replacement for the Hyundai Equus, an SUV, and several other, unnamed models. We’re glad to know that one of our favorite vehicles is garnering enough interest to spawn its own line, and we’re thrilled to be part of this new luxury brand! What a difference 30 years makes. Hyundai entered the U.S. market in 1986 with the Excel, a car whose biggest selling point was its low selling price. The largest Korean carmaker may have gained momentum with affordable vehicles and an unbeatable warranty, but it was Hyundai’s award-winning lineup of vehicles that allowed them to sell their 10 millionth vehicle in the United States last month. Nearly half of those sales have come from the Sonata and Elantra, cars that have improved and evolved for nearly as long as Hyundai has. Both were introduced into the North American market as little more than bare-bones sedans, yet both now offer quality and technology that put most sedans on the road to shame. The 2015 Sonata was the first vehicle to come with Android Auto, which allows the Android smartphone operating system to run through the car’s infotainment screen. Fittingly, Hyundai’s milestone in the American market would not have been possible without the 2005 opening of Hyundai Motor Manufacturing Alabama (HMMA), whose Montgomery automotive assembly and manufacturing plant has accounted for 2.66 million of the Hyundai’s 10 million vehicles sold in the United States. At present, over 50% of Hyundai’s sold in the U.S. are manufactured at HMMA. This is a very exciting time for Hyundai, and it’s clear that the company will reach the 20 million vehicle mark much faster than they reached the 10 million mark. We’ve come a long way from the Excel, and those changes are felt not just in the quality of our vehicles, but also in Hyundai’s overall philosophy. Hyundai kept its industry-leading warranty program, but started making vehicles with an eye towards exceptional quality, not just exceptional value. There has never been a better time to buy a Hyundai, and we look forward to whatever comes next from this incredible company! When the first Genesis hit the road, Hyundai marketed it as a world-class sports sedan with a down-to-earth price, offering “the performance of a BMW 5-Series and the interior packaging of a 7-Series at the price of a 3-Series.” Yet despite managing to follow through on such lofty pronouncements, Hyundai’s outdated reputation as a bargain brand meant the Genesis competitive price-point has tended to overshadow its comfort and performance. 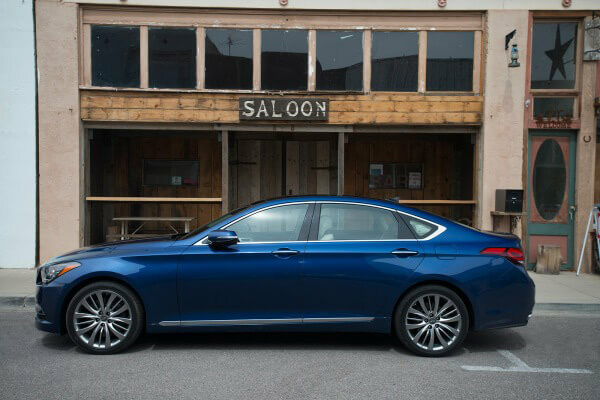 Perception may continue to skew in favor of Hyundai’s discount roots, but getting behind the wheel of the 2015 Genesis is more than enough to drive home the reality: the Genesis is a driver’s car, and a force to be reckoned with in its segment. New to the second generation of Hyundai’s top-shelf offering is the Genesis’ bold styling, which has abandoned the stately-yet-understated body it debuted with in 2009 for swooping lines that are reminiscent of the German luxury incumbents it gives a run for their money. The Genesis’ crowning achievement may be how deftly it navigates the divide between comfort and performance. Its interior is refined bordering on opulent, sporting premium leather, beautiful wood trim, heated seats, and a surprisingly intuitive infotainment center. Yet when the Genesis gets on the road, its more-than 300 horses hit full stride in a manner not typically associated with an outstandingly comfortable car. Want a car that feels palatial but sports incredible steering-feel? The Genesis may be for you. We love many of the cars we test drive, but the Genesis we took for a spin is one of the few that sorely tempted us to “accidentally” miss our exit on the way home. By not creating a separate brand for its luxury division, Hyundai makes it clear that they are not emulating the Genesis’ European competitors in pretention; rather, the Genesis is designed to prove, once and for all, that a Korean car manufacturer has what it takes to make a vehicle that, like the heavyweights it puts itself in direct competition with, is an absolute joy to drive.